Vintage Eterna Matic Centenaire wrist watch dating to 1956 based on the movement serial number. 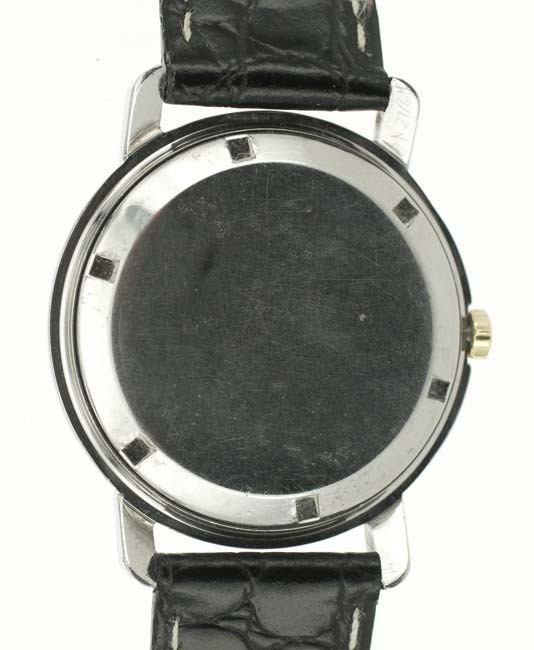 This stylish vintage watch is a perfect reflection of the wrist watch style of the 1950’s. 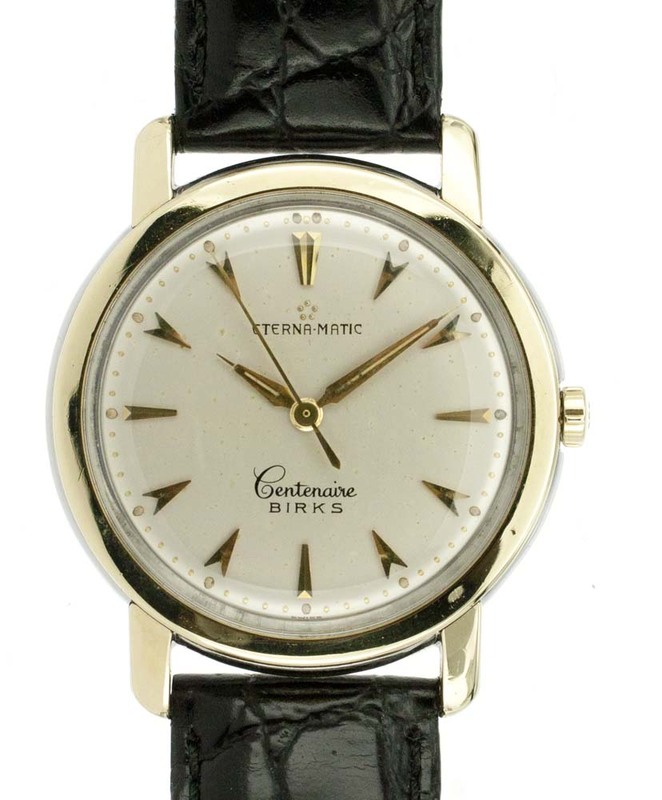 One interesting bit of information about the model name Centenaire, it was first used in 1956 to commemorate the 100th anniversary of Eterna’s founding. 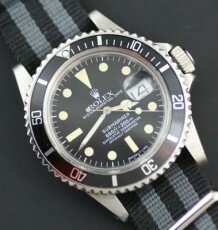 The substantial almost chunky case is quite similar to the approach used by Omega during this period. 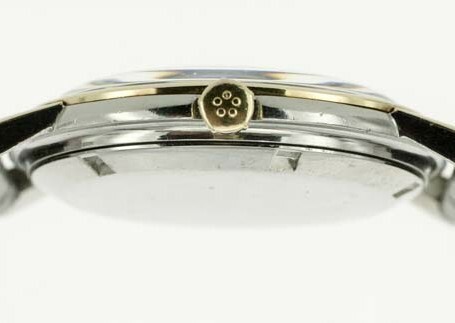 The stainless steel case features a solid steel screw down case back with a steel case middle and a solid gold layer of gold capping over the top surface of the watch. 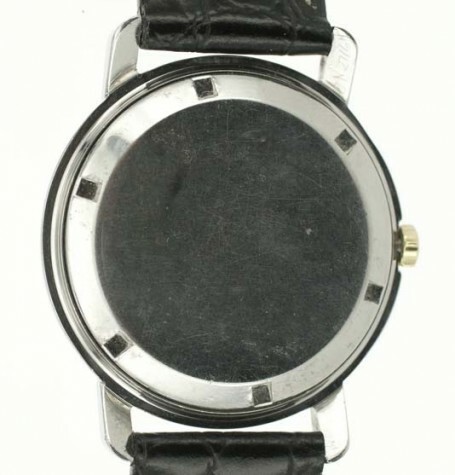 The round bezel that surrounds the face of the watch is actually a solid gold bezel that will not wear. The remaining gold capping is also thicker than plating and shows no wear through. 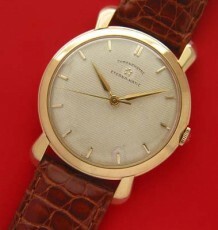 Also note the original signed Eterna gold crown still fitted to the watch. Overall, the case is in excellent condition. The white dial has the slightest antiquing patina and is all 100% original. 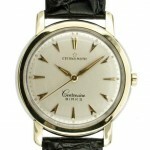 The dial utilizes gold coloured arrowhead hour markers which again reflect the styling of the 1950’s. The dial design pairs well with the original gold dauphine hands fitted to the watch. 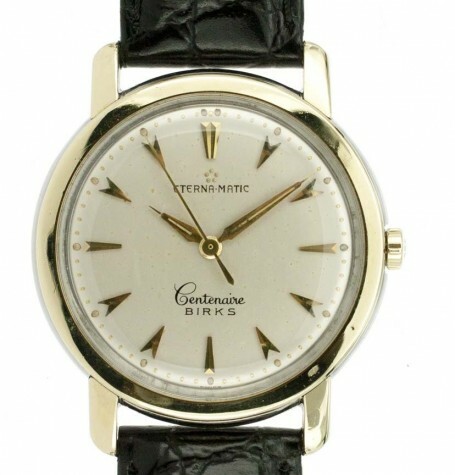 Note the delicate script of the Centenaire model text on the lower portion of the dial. 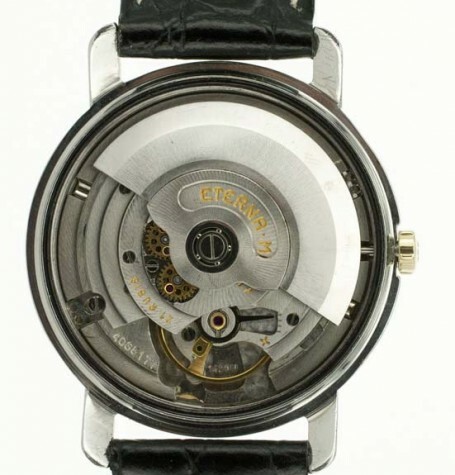 This particular watch was retailed by Canadian jewellery retailer, Birks, often referred to as the Tiffany’s of Canada. Birks continues today as Canada’s largest jeweller. The watch is powered by an Eterna calibre 1429U automatic movement. 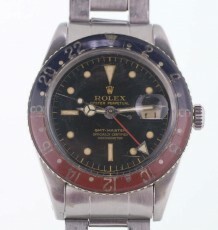 This movement is based on an early ETA movement and features 21 jewels. The watch was just serviced and is functioning flawlessly. 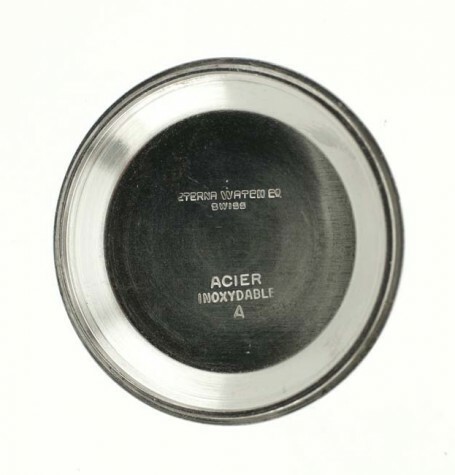 Overall the watch is quite similar in form, function and quality to the early Omega rotor automatic watches sought after by watch collectors around the Globe. The main difference is that this Eterna does not carry the higher price tag that the Omega does. This vintage Eterna Matic Centenaire measures 34.5 mm wide and takes a 18 mm leather strap, again just as the Omegas from this period measure. 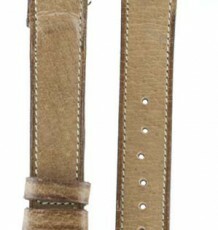 The buyer has a choice of black or brown leather strap fitted to the watch. 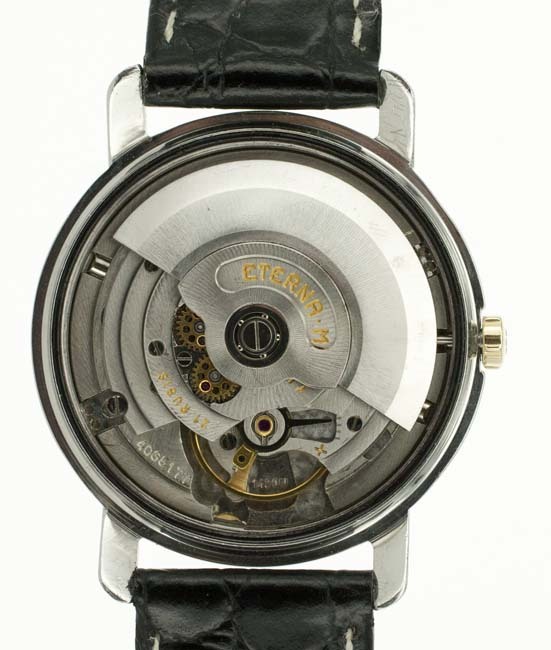 For more information on the vintage Eterna Matic Centenaire please visit this site.